Payment records in Easy Digital Downloads can be modified at any time. To edit a payment, navigate to Downloads - > Payment History and click on "View Order Details". Once you have made your desired changes on that page, hit the "Save Payment" button to make your changes official. Why would I change the information on a payment record? Changing the associated downloads. Customers make mistakes. It happens. When a customer contacts you and informs you that they purchased Product A but actually needed Product B, being able to tell the customer "No problem!" and then simply change the download attached to the payment is awesome. Processing refunds. If you have sales, you will eventually have refund requests. With Easy Digital Downloads, processing refunds is possible right from the edit payment screen. Changing the assigned customer. Occasionally customers request for a purchase to be associated with a different customer account on your site. Fulfilling this request requires only clicking on the "Assign to another customer" link and then searching to find the desired account. Generating new license keys. If you are using the Software Licensing extension, there are occasionally situations in which payment records are manually created but the associated customers need new license keys to be generated. With this extension active, a "Generate License Keys" button will be present on the payment edit screen and, when clicked, will generate brand new license keys for all the products in the payment which apply. This is only a short list of examples and many more exist. With Easy Digital Downloads, making changes to payments as needed is simple and straightforward. What payment information can be changed? Payment Status. Changing the selection for Status will change the payment status for the current record. If the gateway used for the purchase supports refunds and is configured properly, setting the status to Refunded will reveal an option to refund the customer's money from the payment gateway. Date and time. If needed, the date and time fields allow for changing when the payment should show as being created. Total price. Changing the total price value will change the value of the purchase, regardless of the actual amount calculated based on items, discounts, fees, etc. This only changes the value in your records and on the customer's purchase receipt. It does not retroactively affect the customer's billing. File download limits. A checkbox exists on the payment edit screen labeled "Unlimited file downloads". Checking this box overrides the File Download Limit value set in Downloads - > Settings - > Misc - > File Downloads and grants the assigned customer unlimited download privileges for the items attached to the current payment. Purchased downloads. The items purchased can be customized completely. 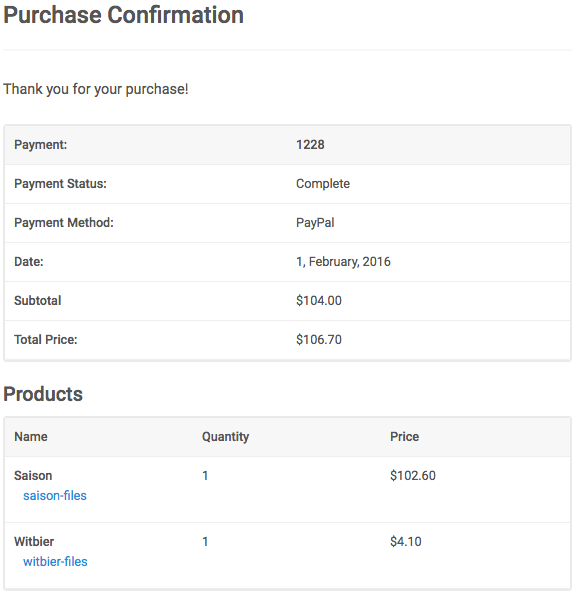 On the payment edit screen you can add, remove and modify the downloads included in the purchase. Customer. The assigned customer for the current purchase record can be easily changed by clicking on the "Assign to another customer" link and then searching for the correct user. Additionally, the billing address for the customer can be modified for this specific payment right below the customer selection. Payment notes. When certain actions are taken or events occur, EDD Bot will log notes on payment records with any relevant details. But manual notes can also be saved. If you have any information which you or other store managers need to know about a specific payment, leaving a note on the payment will help provide contextual guidance for anyone viewing the purchase details in the future. How do changes to a payment record affect the customer? This means, if you add a new download to a payment, the customer will see that download listed on their receipt along with a link to the files. Or if you change the associated customer for a payment, the original customer will no longer see that entry listed in their purchase history and the newly assigned customer will see that entry listed. Email receipts are not automatically resent when payments are updated. 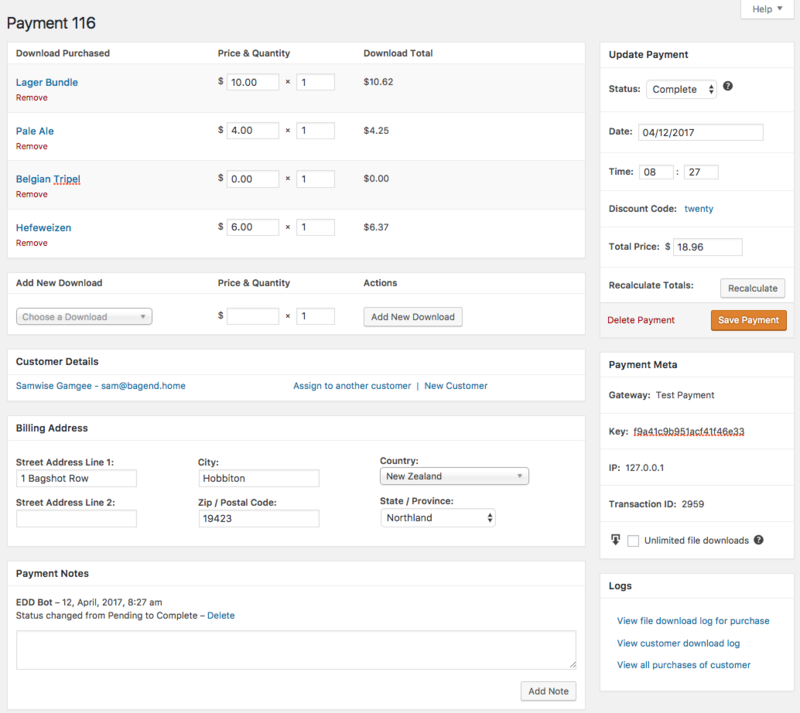 You can manually resend the receipt from the payment edit screen using the "Resend Receipt" button. Additionally, customers can trigger a new emailed receipt on their own if the Resend Receipt extension is active.